Have you ever thought, I'm ready to throw out everything in my closet and start over? Because you're bored with your clothes? It feels like nothing looks good on you? When you need that "great outfit" for a special event, you never have it? Did you know that Only 20% of the clothes in the average persons closet are worn on a regular basis according to chief design officer of California closets. It’s a question we ponder every time we stare into our wardrobes and have no clue what to wear. It doesn’t make sense. Your closet is full. Is it because you're a creature of habit who can’t be bothered to try new things? You know it works, so you just keep wearing the same outfit over and over? A couple of things could be going on. You get a compliment on the outfit and you know it works. So why change. Or do you have a lot of impulse buys? It looked great in the store or you were at a clothing party and the sales person said, OMG you have to buy that! Recently, I met with my new client Heather, who was the one who said, I'm OK with throwing EVERYTHING away and starting from scratch. Before we do that, I told Heather, I always spend some time in the closet to see if there are any great pieces we can work with. I come in with a "fresh pair of eyes"
Many of her purchases originated because her sister-in-law said, "you've got to buy that" as they were shopping. Did you know that when others influence you to buy they are seeing themselves wearing the outfit, not necessarily if it looks good on you? The day I entered Heather's closet, I helped her create 15 NEW outfits that she never knew existed. She was blown away! She told me the clothes we threw out, cost her more than the fee she paid me. Had she known what didn't look good on her, she would have NEVER purchased those pieces. 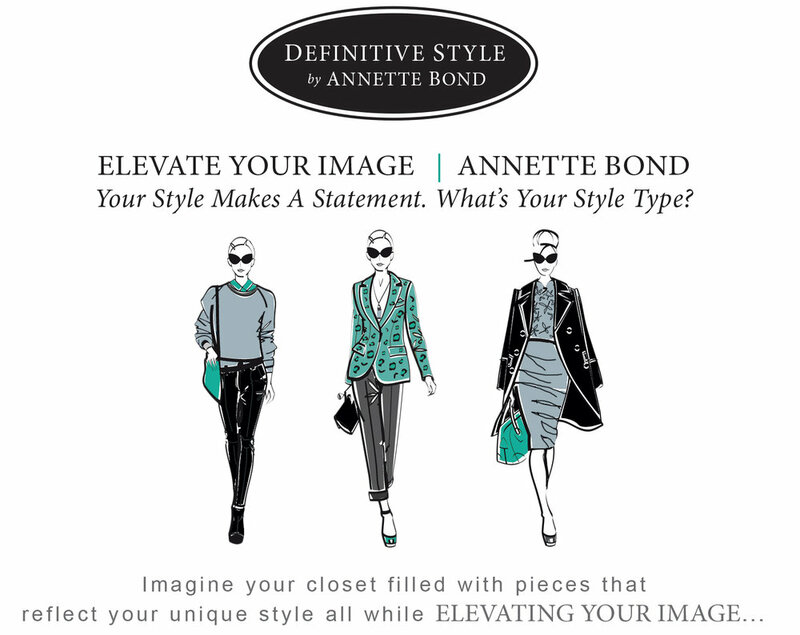 Annette, I'm ready to start LOVING my closet and want it filled with pieces that reflect my unique style. 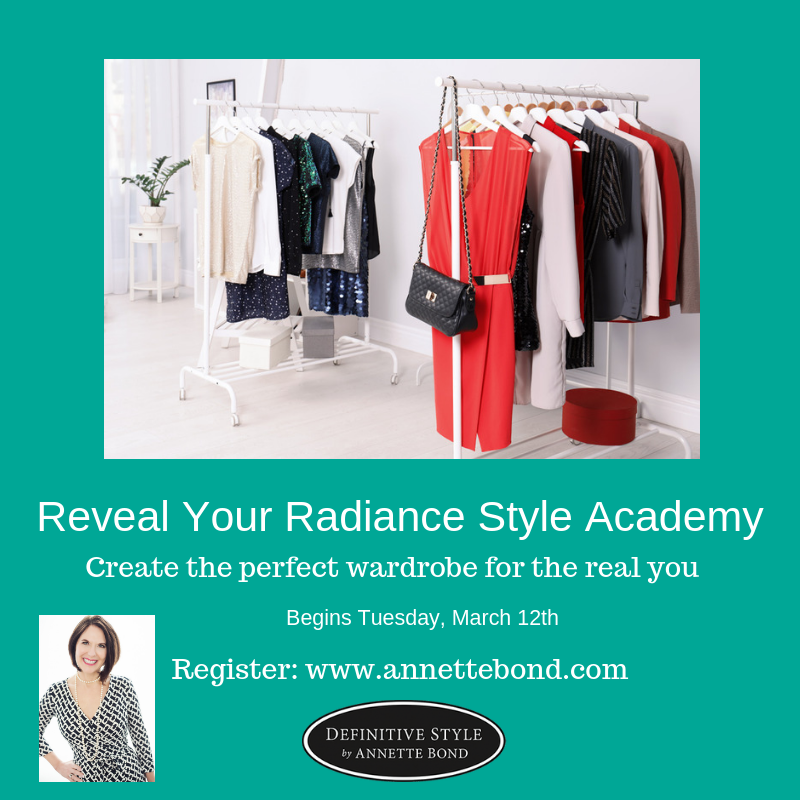 Annette Bond works with accomplished, professional women to Elevate their Image. She inspires women to elevate and express the best of who they are Now, so they can go out into the world with greater confidence and ease. Your Style Makes a Statement. What’s Your Style Type? Is your wardrobe in a style rut? Do you waste a lot of mental energy trying to figure out what to wear? Are you feeling stuck and not sure where to begin? Do You Fantasize about Having a Wardrobe That Reflects Your Unique Style? Get Your Tickets Today & Receive Early Bird Pricing / Register NOW! Annette Bond, works with accomplished, professional women to Elevate their Image. What Does Speaking Style Have To Do With Personal Style? I knew something wasn't quite right. I needed a professional opinion. She looked over my handout, called me and said, "some of it is good but much of this doesn't sound like you". You would never speak to me about my style like that. My heart sunk, I knew it was true. I was trying to please the event organizer and wasn't being 100% authentic to who Annette Bond was. Debby told me to "stand confident" in my content. Because when I do, I will speak from my heart about what I believe and teach. What I love about Debby, is she knows me. She wants me to reveal the Annette Bond definitive writing & speaking Style. Debby also shared, that while the event organizer was well-intended with her guidelines and suggestions, I needed to discern if what she suggested was elevating or diminishing my style of speaking. What I realized, Debby was coaching me on what I literally share with my clients. I thought dahhhh. We can get consumed of what others think of us that we lose sight of who we really are. So the moral of the story is...you need to listen to yourself. Know your strengths and stand confidently and strong in who you are. Trust yourself. Feeling that sense of comfort that you are in your element speaks volumes. You can only then "Reveal Your Radiance" for others to see the beauty of who you really are. As I tell my clients, I want you to feel sooo confident in your outfit that you forget about what you're wearing so you can go out and do what you do best. I'm your Debby when it comes to personal style. We all need those special people around us that make us better. When you get dressed in the morning is your mind going toward black pants, black skirt, black jacket, black shirt? It goes with everything right? Did you know that relying on neutrals to be the foundation of your wardrobe is a good thing? But there are other options. Such as adding navy, taupe, light gray, charcoal gray, camel, khaki, brown, and burgundy to name a few. One of my favorite neutrals this season is navy. What I like about navy is it is a nice alternative to black. It is a softer version of black. It goes with ALL the same colors that black coordinates with. TIP! Navy blazer's are seasonless and always make you feel put together, even when you're wearing something simple. TIP! Make sure the cut and style of the jacket are congruent with your body type. These could be black or navy. Everyone needs that one pair of jeans that makes them feel amazing. TIP! The darker the wash the more polished your jeans will look. I love the NYDJ - they help with concealing the tummy area while allowing you to move freely with the added lycra. TIP! Espadrilles are great option for dressing up a pair of jeans or shorts and dressing down a summer skirt or dress. TIP! Add them to your bright colors as your New Navy neutral. I find that changing ONE element in your wardrobe each season can provide the inspired refresh that you've been looking for.